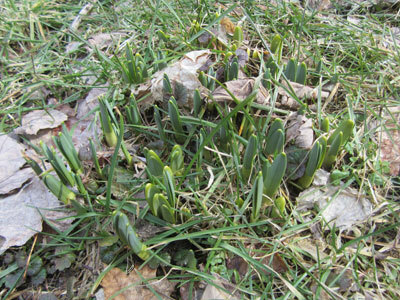 March and April are clean-up months in Massachusetts, because there is still a chance of frost. 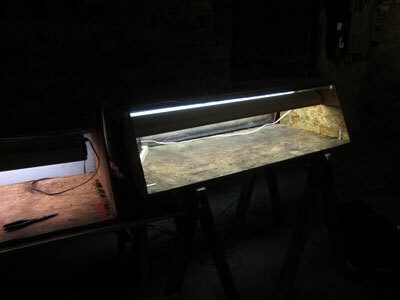 I used them to fertilize the daffodil bulbs (4 lbs of fertilizer per 60 sq ft), mom’s been planting pansies, and we put together eight seed trays of seeds for planting around Memorial Day weekend between us, in light boxes we’ve set up in the basement. Look, pictures! First up, daffodil bulbs poking their heads up out of the dirt. 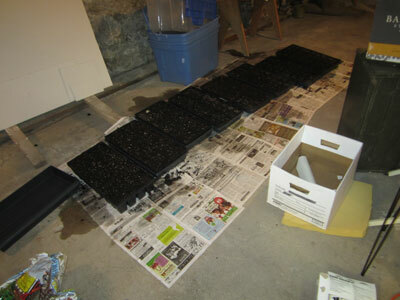 Then our seed boxes, and seed trays full of potential (and water). 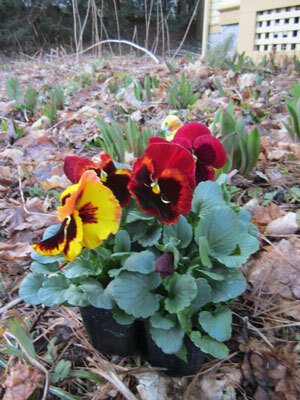 Plus two pictures of pansies. Since I started this post the world has entered May, to my dismay and hurry. I lost two weeks to a throat infection and two more weekends before that to a heavenly vacation in England, which was great but not really helping me keep busy. Our sunflower and tomato babies are outgrowing their space, and if I’m lucky they’ll put up with being inside until Memorial Day weekend, the traditional time to plant in this part of the world. It’s been dry here, with sparse rain and a constant stream of conversation about hoses and drip hoses and while we’re at it, how about adding a water feature back by the dogwood bush? It’s a lovely season with everything leafing, and I’ve been spending the day wrestling with the push mower. 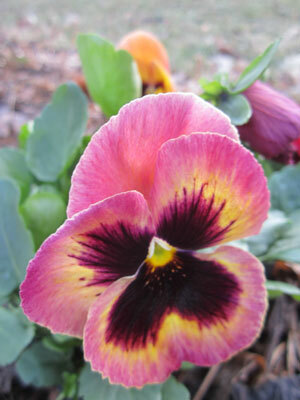 Mom’s been making candied violets with egg whites, a paintbrush, and multicolored sugars. There is also a rhubarb cake on the conference table, thus proving why we garden in the first place. 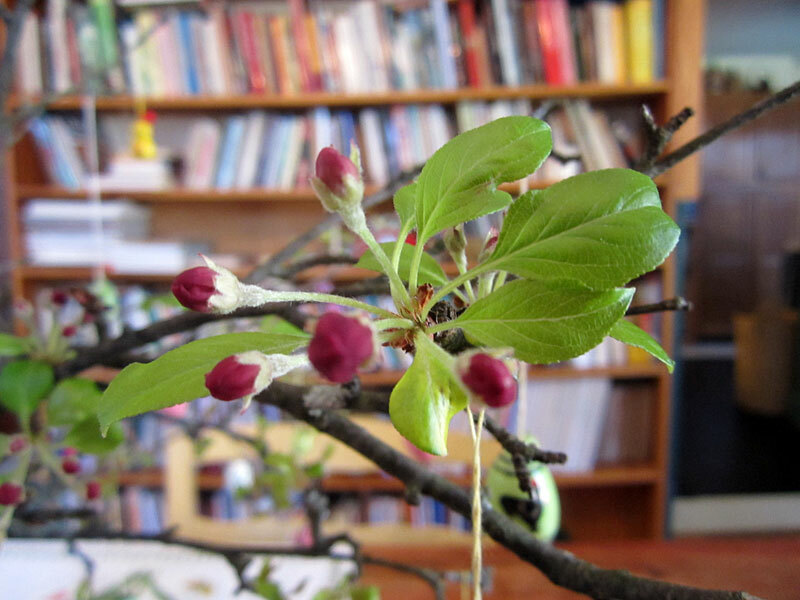 I have quince flowers on my desk, that deep red that is hard to capture with words, because it has overtones and undertones and a sense of solidity that defies my attempt to explain it. 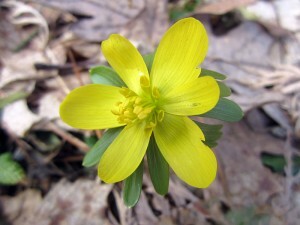 In the hills of western Massachusetts, the first flowers that bloom in my garden are winter aconite. Winter aconite is a small yellow flower in the genus Eranthis and the family Ranunculaceae. The Ranunculaceae is the buttercup family, and I must admit it isn’t one of my favorites. I favor water lilies and oak trees and peas. Still, when winter has so starved you for color that the green of a new bloom of algae is as welcome as swaths of bluebells or fields of lavender, I’ll take what I can get. Traditionally, the first accepted sign of spring here is when the red-breasted robins arrive from their winter away. I’ve seen a few so far this spring, and skunks out hopefully seeking mates, a quest to which we leave them with all good will and the hope that they will do so far away from our backyards. I associate spring with the pale robin’s egg blue of the shells pushed out of the nest once the baby birds are done hatching. The association between Easter and eggs (and chickens) is a strong one, especially in the Norwegian tradition of my family. Here’s a tutorial about Norwegian egg painting, which also show up during family Christmas-time. Our creativity as a family has tended towards food coloring plaids, not the delicate designs some artists can muster. What else symbolizes spring? New sweets, hidden carefully around the home, symbolize the thawing of rivers and the availability of new treasures and trade. 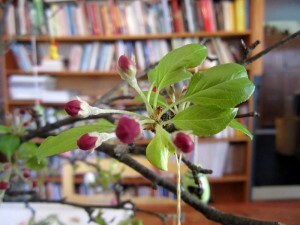 Apple or cherry branches, brought inside to sit in water, bloom early when ‘forced.’ The promises of fruit and abundance and above all, to me, color. Winter is a pale, monochrome time, and reminds me of living on an army base (an experience I enjoyed but which brought home to me the importance of color in our lives, as I started to climb the off-white concrete walls). Yellow aconite, red and blue plaid eggs, pale blue robin’s eggs and red robin’s breasts. Green algae and pink apple blossoms. That, to me, is spring.